After I nearly hijacked the Legolas swooning thread for Maedhros, I realized we really need a place to appreciate all the guys who came before the War of the Ring. It is my hope that this thread can be a place to combine both lighthearted swooning and serious discussion of JRR's wonderful characters from the histories. I shall begin with my first truly on-topic sw n for Russandol! I missed this thread yesterday. Thank you Doni for opening it and I hope we do get people posting here too since the Sil is full of characters to swoon for. SW NN!!! for him. It is not every day that someone can reteach himself to fight with the other hand and achieve the same level of skill. Oh, but he did better than that; he surpassed his previous level of skill! He lived to wield his sword with his left hand more deadly than his right had been. Did you notice that of Fëanor's sons, the one accorded most beautiful in physical form (judging from his mother-name) should be the one to suffer an injury that left him maimed. Poor Maitimo! I've started reading the Akallabeth, and was struck by the question of whether the Elves who returned to the Undying Lands from Middle-earth were allowed to return to Aman or if they could go no farther that Tol Eressea. Do you know if Tolkien ever addresses this anywhere? Hi Doni! Lovely thread, here. I probably won't be coming here much because I haven't read the Sil yet, but I will visit more often once I have. I'm glad you were able to make a special Sil Swooning thread. Good luck! Doni, I was like 99% sure that he did learn to wield the sword better with the left but it was late at night and I was too lazy to check so I went out on sure ground. Did you notice that of Fëanor's sons, the one accorded most beautiful in physical form (judging from his mother-name) should be the one to suffer an injury that left him maimed. I never thought of it like that but you are right. I was just thinking yesterday how strange it was - Maedhros did step up, and considering the fact that he was the oldest, he could not have been among the last of the seven to do so (just speculating but I guess that might have been Maglor or Amras). However after that he was the one to ask his father after landing on ME who would the ships bring over next, he also relinquished the kingship of the Noldor, so you see him, more than any of his brothers atoning and paying for what the Oath produced from the beginning. The return to Aman vs Tol Eresseä is something that for me is still unclear too, I do not remember right now anything stating one or the other expressly. But I do think myself that the Elves could remove from Tol Eresseä to Valinor, maybe after some time or something if not when they wished immediately. My reasoning is based on first the fact that though Tol Eresseä was not a little island, it would get maybe too crowded if the Noldor and Sindar (and their offspring) all had to live there. And secondly - it would create an unfair situation comparing the Elves who were slain or died or grief and the ones who sailed to the West. We have the "where he now walks with Finarfin his father (and in HoMe also with Amariė) about Finrod and Glorfindel's probable sojourn in Aman before coming back to ME, so the ones who died were reborn in Aman. It would seem unjust for those who came through the Halls of Mandos were joined with their kin who were in Aman or had died before them and reborn, however the ones who had left on their own will by ship, were stuck on the island. Excellent thread, Doni. I am all too ready to do some serious Sil swooning. And today I think I shall swoon for Beleg Cúthalion, for although I tend to give the guy in my sig all the attention, poor Beleg was one of the most dedicated friends in all of Tolkien, and I do adore him. Hear, hear for Beleg! I quite agree! Beleg's and Turins friendship is one of the most moving, especially seeing where it ended up. About the Valinor and Eresseä. "When at last that war (War of the Jewels) was ended, most of the exiled Noldor returned over the Sea to Valinor or to the land of Eresseä that lies near." "Indeed we learn now in Eresseä from the Valar, through our kin that dwell still in Aman,..."
The last seems to indicate that the Valinor Elves could come to visit the Elves on Eresseä. It seems to me, also, that the Elves were allowed to live where they wished when they returned to the west. I've been looking at some of the HoME books, and have found many statements that the Elves returned to Valinor and Eressëa. Since both places are listed together, I gather the Elves could chose where to stay. I was reading some of Tolkien's early writings for the Silmarillion in HoME IV and was rather intrigued that at first, Maedhros was the brother who wanted to return to Aman and wait for the Valar to return the Silmarils, and Maglor it was who argued that they dare not bring war into the Blessed Realm, but should fight to regain the Silmarils while still in Middle-earth. Also, in that same version of the tale, when the brothers sneaked into the camp to steal back the jewels and the camp awoke, Maglor escaped, while Maedhros was captured. 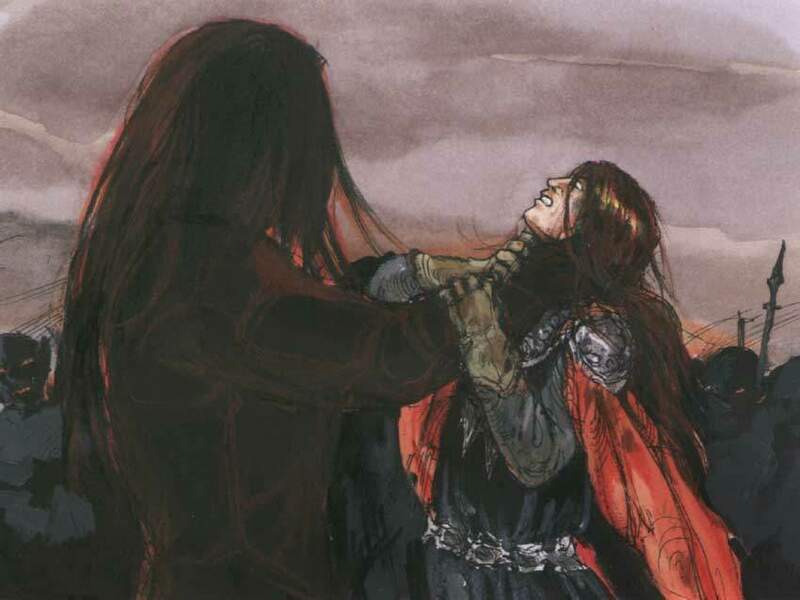 Maedhros then threw down his Silmaril and took his own life. Maglor later cast his Silmaril into a fiery chasm, and went off singing in pain and regret beside the sea. I must say I prefer the ends of Maedhros and Maglor that occur in the Silmarillion. Maedhros does kill himself either way, but throwing himself into the flames of the earth somehow doesn't seem as bad to me as falling upon his sword (as I'm assuming he made his end in the early version). but it was late at night and I was too lazy to check so I went out on sure ground. On a happier note, SW N for Voronwë! I love his name and its meaning, and his story is good, as well. Oh, yes, now I remember too that Maedhros' and Maglor's places were inverted in the older Sil. It does concur more with Maglor as a singer to be of a mellower and more "law-abiding" than Maedhros, the oldest son of Fėanor. I remember while reading I found the different end of Maedhros that it would have been interesting to have that not disappeared from the later rewritings. 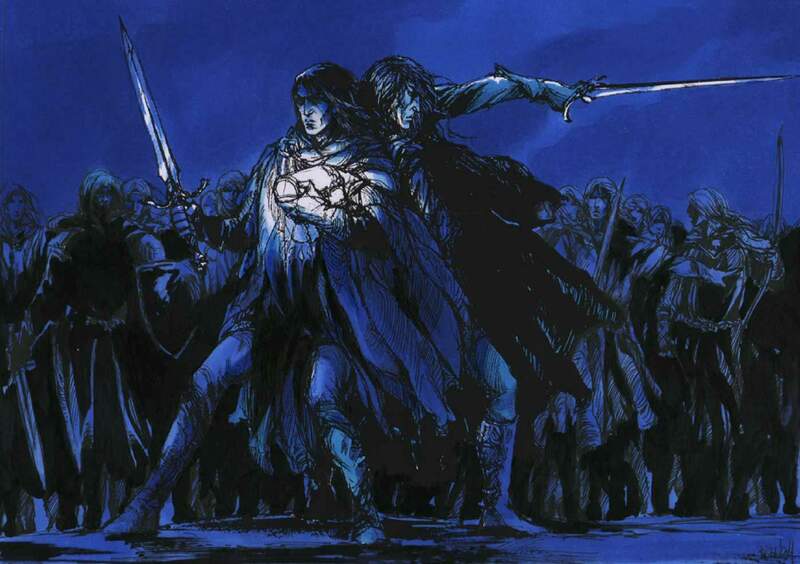 Though we are dealing with taking his own life on both accounts (and I agree that doing it with a sword seems more bad), the surrendering the Silmaril after being captured makes his suicide less bad since the jewel ended up with the ones who he was supposed to have surrendered it and not to the deeps of the earth. However taking all into account the throwing the Silmaril into the flames of the earth has more symbolism and allows for the earth-sea-sky thing and avoids the repetitiveness with Turin and his falling on his sword, the one that is in the published Sil is more poetic. While cheking the HoMe IV for the Quenta I also found another reference to Celegorm's fair hair - as translated to Old English as Cynegrim Foegerfeax* - Celegorm "Fairfax". Maedhros is called Doegred* Winsterhand, meaning Dawn(Daybreak) Left-handed. The name Doegred could be associated with the name Russandol and him having red hair, as guessed by Ch. Tolkien. since I liked his story more than his cousin's and his nature too (Turin was a bit too arrogant) and out of all the Lost Tales, I love the Fall of Gondolin the most and I am very sad that JRR never had time to turn back to it. I haven't visited this thread yet. But now having read it, it seems like a really great thing. That's wonderful of you to have started such a thing, Doni! You have very interesting discussions here! And yet so much tears ... No wonder. When I first read the Sil, I thought "My Lord, why should there be so much sorrow in the world?!" Later when I learned more about Tolkien and read or reread his other works, I understood it better. But I still remember how the story of Túrin's sister, Lalaith struck me. In the Sil there is only one line, telling us about her - "A daughter they had also who was called Lalaith, which is Laughter, and she was beloved by Túrin her brother; but when she was three years old there came a pestilence to Hithlum, borne on an evil wind out of Angband, and she died." Of course, there is more about her in "Narn i hín Húrin", but somehow this line always brings tears to my eyes. Tolkien manages to bring in Laughter in the beginning of a sentence and take it away in the end of the same sentence. He always manages to bring sorrow with such simplicity that it's unbearable. Swooooon for Maedhros and Beleg!!!! It can be a really depressing book when read the first time with not a lot of knowledge of Tolkien's works on the First Age. But when thinking of it more and reading it again you start to see the bittersweetness and beauty laying in the tragedies. To me, the line after the coming of the Green-elves and before the First Battle of Beleriand - "But of bliss and glad life there is little to be said, before it ends; as works fair and wonderful, while still they endure for eyes to see, are their own record, and only when they are in peril or broken for ever do they pass into song." - really takes it all together. As well as what Tolkien said in one of his letters that ran like "to know what is good, you have to know evil too" - if there were no tragedies, you would not cherish the moments of happiness in between and there are those in the Sil, even in Turin's story. The Lailath thing I do understand. The line in the Sil did not I thing affect me that much but just today I was searching for something for a trivia game and read again the passage in UT of Lailath and Turin's reactions an it just made me so sad. I had not even remembered that Turin said to Sador that he would like to have been of Elf kin and Lailath too, so she could come back. anuhealani wrote: This may be the wrong thread, but I want to swoon for UT, too. Oh, go right ahead. I chose the title of "Silmarillion Swooning" for it's alliteration, and for the fact that the Sil's time span encompasses all those we'd like to swoon for who don't appear in LotR. So, don't worry about swooning for someone not strictly mentioned in the published Silmarillion. I've more discussion and swooning I'd love to do, but in the words of Pippin, "And now to bed, And now to bed!" A quick parting sw n for Maglor! Yeah, Tuor is a really nice guy, kind of too good to be true and therefore of course less interesting than say Turin. About him for me the most intriguing is did he really become an Elf then or not? The "accounted amongst the Elves" would suggest that and though it is guessed to be so in Sil, it would make sense in symmerty and not have only an Elf be reincarnated as a Man but also the other way around. Since I am a sucker for happy endings, I do want and do believe that he did. UT is great. I remember when first reading it, I thought how difficult it was with the notes and pieces of different writings in the History of Galadriel and Celeborn but of course when I started reading HoMe, UT looked easy. The tale of Aldarion and Erendis is really interesting to me. It has a love story but not in a tale-like form as the others and the complexity of it is the highest of all what Tolkien wrote of different couples. It starts of like somewhat a predictable thing and then you find out it is not at all so. Hello fellow Sil geeks...I am about to leave work behind for 4 days for a scrumptiously crunchable Thanksgiving holiday, but I couldn't leave without saying namárië! I hope all of you have a nice next few days and/or Thanksgiving. Anu, have a great Thanksgiving! I was looking at Catherine Karina Chmiel's gallery the other day and discovered that she has quite a few paintings/drawings of the Fëanoreans, Maedhros in particular. Catherin's portrayal of Maedhros is completely different than Jenny Dolfen's, but I still find him quite swoonable. 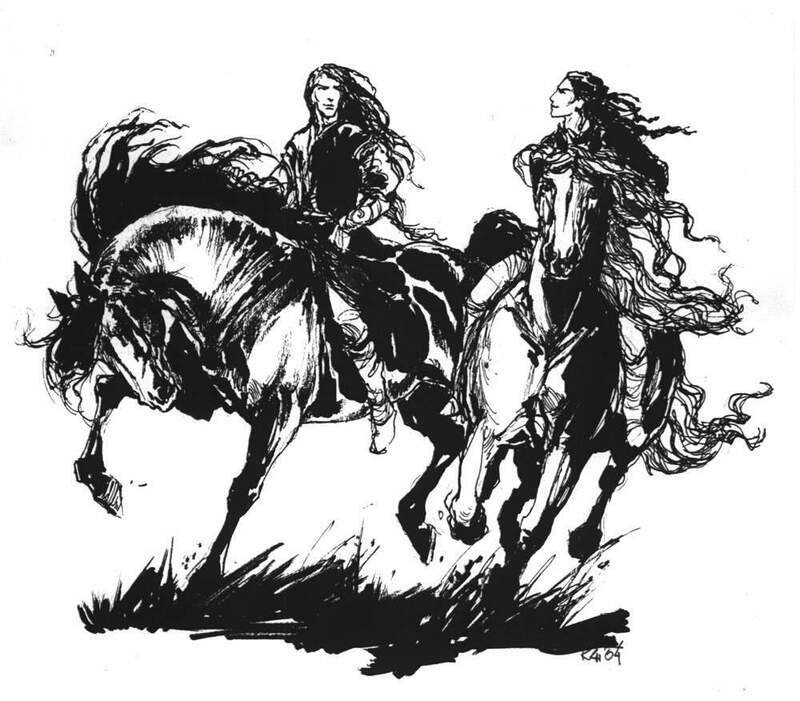 Two of my favourite pictures are this of Maedhros and Fingon and this of Maedhros and Maglor. I like the first because it shows the two Elves in the happiness of Valinor before the Oath tore their families apart. The second I like for the dramatic use of light to focus the viewer on Maedhros and Maglor and for the excellent portrayal of their desperation to complete their oath. Aurelin, the Old English names and their meanings are quite interesting. I particularly like Doegred, Dawn. 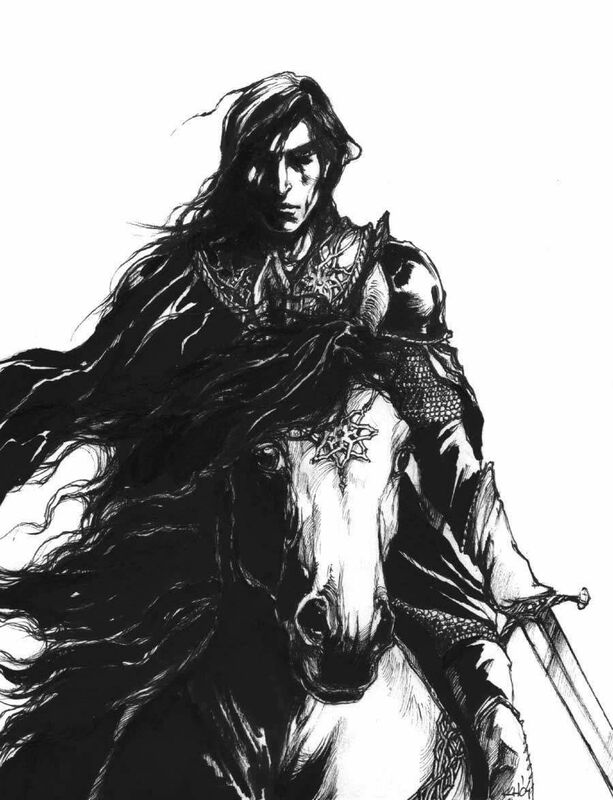 I was scrounging for Fëanorians today and I found an interesting drawing of Fëanor I'd never seen before. I still haven't seen any I really like very much (does anybody know any good, obscure Sil artists?) but the expression on his face is wonderful, I thought. How funny, Doni--we were just talking about Chmiel in the Faz thread earlier today. I love her work (mostly for her Gondor boys). As for Maedhros, I particularly like this one (it's one of her newest), even though I suppose it really could be anybody. Doni, thank you for the link to the wonderful gallery. Wow, so many beautiful pics! I agree that those pics you mentioned are the ones I really liked too. I also loved the Luthien-Beren-Celegorm-Curufin one (I think it is one of the first pics I have seen where Luthien's face is visible, always she is painted with back to her or face to far to make anything out. And I understand why - portraying someone said to be the most beautiful of all, is hard). The Lorien one was nice and this too. The Celebrimbor one was really powerful and the one of Maedhros watching the ships of the Teleri burn. The Fėanor one was interesting since it is so different from the ones I have seen lately. How could I possible skip this thread ?! Welcome, None_Elf_Ear! I hope we get more traffic to this thread. The Sil is filled with so many wonderful people and stories. I want to make everybody read it at least once. Some more Fëanorians for you. You don't hear it much, but awwww, they're cute. Don't know what's up with Fëanor's hair, though. And a random observation: As I was telling Doni over in the Túrin swooning thread, I love seeing people's very different visions of Sil characters. So it's highly interesting to me that there's seems to be very little variation in people's image of Maglor. At the very least, there's always an element of infinite sadness at the core of the picture--even ones set during the days of the Trees. Here's one version, by the same artist who did the Fëanorians above. Jenny Dolfen also does a beautiful Maglor. And another striking picture I just found today. It breaks my heart to think of what he must have been going through when he finally gave up his Silmaril. Even Ezpeleta's bears a striking resemblance to the others. *waves to None* Great to see you here! Don't know what's up with Fëanor's hair, though. Hehee, he looks like underwater or something or having a hairdrier somewhere behind him. I never thought of that but Maglor does seem to be the character people tend to picture similarly. The melancholy I think comes with the profession of a poet and bard, since most good poems and songs are of sad things. He is maybe the most tragic of the seven sons since being a poet, it is to be guessed that from the moment of the swearing of the Oath he would be the most sensitive towards all the bad that came from it. And in Beleriand the Second and Third Kinslaying, for a bard-like character to commit those deeds seems so unnatural that the drive the Oath gave him to be part of the slayings seems the worst and it would be him, I think who would always have in the back of his mind, how wrong everything he and his brethen did, was. And even in the end, he was not released from his pains and sorrows by dieing and starting to get peace of mind little by little in the Halls of Mandos, he was left alone with the knowledge of his deeds until who knew how long. Doni, I think you will be proud of me - I have started the rewriting of the Maedhros story! The Fingon one is very good, too. That's not how I see him, but like Anu said, it's cool to see so many different visions of the characters. Awww...yes, the Fëanoreans are cute. I don't mind Fëanor's hair. I like the way it seems to be blowing in the wind; that gives a very nice sense of motion to the pic. I think my favourite of the sons is Curufin. He looks just like his father, which is quite appropriate. Maedhros's braid is a little weird. Anu, I saw your comment on that one. I've looked at only a few of Ezpeleta's works since I don't care for her style. Her use of colors and the detail and texture that she puts in her workis very nice, though. I do like how she has depicted the Fëanoreans with their swords drawn--that forshortening of the blades is very cool. I find it interesting that she has drawn her Elves with a very Asian look about them. Some of Ezpeleta's paintings are almost a bit disturbing. What exactly is the scene supposed to be in her painting of Maeglin? And that pic of Thranduil! EEK! And now about Chmiel. 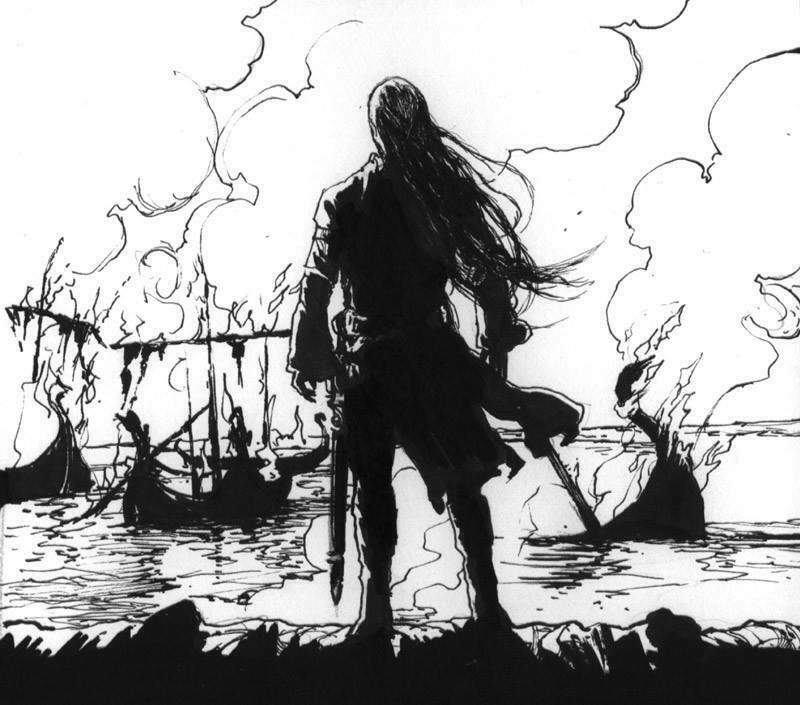 Yes, I also liked that pic of Maedhros watching the ships burn. *deep sigh* I'm depressed and inspired at the same time. Depressed because my drawing skills are not so great. Inspired because now I feel like practicing. Actually, considering that I first attempted to draw the human form only two years ago(before that my artistic endeavors were devoted entirely to cats and horses), I'm doing fairly well. I usually only draw when the mood takes me (which means I may draw often for a while, and then go a long stretch without doing so), so also considering my small amount of practice, I'm progressing well. I've got a very lovely drawing of an elf maiden nearly done. I should finish the poor girl. All she lacks is a right hand. I have quite a few drawings of people without hands or feet because I have trouble with those. Aurelin, I'm glad you've been able to work on your tale. I look forward to seeing it. Where exactly does Tolkien say that the emblem of the house of Fëanor is the eight-pointed star? I've seen it used in enough pics that I understand Tolkien must have mentioned it somewhere, but I don't think I've come across it yet. however he certainly is not my type. He's a little too John Travolta-ish. He is, that explains why I did not take to that painting! Well, I did not comment on it before, but I am glad to see I am not the only one who did not like that braid, Doni. And Ezpeleta's style is not for me either, they remind me of some other fantasy books that have races that are the equivalent's of Elves in Tolkien's works (like the Sith in Tad Williams' Memory, Sorrow, Thorn) that said to have cat-like eyes and faces that now that I am thinking of it are quite like Ezpeleta's. Doni, at least you can draw! I am not too good at it, perhaps due to lack of practice but the fact is I am awful at anything but dresses and even then I more just draw them down that make them look natural on the paper. I too have long stretches between my not-pretty attemps at drawing. Mainly I feel the need to draw when I am very sad or depresses, it calms me down. I even took paper and pen to the pre-presentation we had on Wednesday to still my nerves and I think I will do so on Monday as well for the real thing. Hmm, the eight-rayed star. Wait, it is on the gate to Moria, was there not something there of it being the symbol of Fėanor's house? Below, though the threads were in places blurred or broken, the outline could be seen on an anvil and a hammer surmounted by a crown with seven stars. Beneath these again were two trees, each bearing crescent moons. More clearly than all else there shone forth in the middle of the door a single star with many rays. "There are the emblems of Durin!" cried Gimli. "And there is the Tree of the High Elves!" said Legolas. "And the Star of the House of Fėanor", said Gandalf. SW NN!!! for Thingol, somehow of the three ambassadors of the Elves to Valinor I have always liked him the most. I don't even know if I like the Sindar because of him or vice versa. Jenny Dolfen's work is beautiful. Her portrait of Finrod was very nice, exactly like I imagined the Friend of Men. I really like Finrod from the book but I have to say that the portrayal of him by Jenny for some reason does not agree with me, well with the mental picture. He looks a bit too soft, but I am not sure this word is the best to describe my feeling, for an Elf compared to Jenny's Fingon, Fingolfin, Maedhros and so on. Today I'd like to SWOOOOOOONN!! for Beren *thud* what a man he was! Oh wonderful...a Silmarillion swooning thread. Can anybody join? I love that book...love it!! And UT and HoMe..and the rest. Pictures of the Fëanorians..there are lots around, but most of my favourites are by Jenny Dolfen. I also like some of Chmiel's works a lot, particularly 'And they prepaired to die'...so very sad....poor Maedhros and Maglor....I think she captures their despair and the suprise of the Vanyar very well. anuhealani wrote that Fëanor was ' So rotten, so achingly droolicious.' I have to disagree on the 'rotten' bit..I think he had 'issues' !!!!! And I'll swoon for him anyway! Of course, Aranis, join right in! We are glad to have you here. Just keep telling yourself that. That's what I do. And I still swoon. I've never been a fan of Beren, for some reason, Aurelin. I think it's because it always seemed to me that Lúthien wore the pants in that family. Doni, you're a far better artist than I'll ever be! I can join with you in swooning for Finrod, Aramel. I tend to ignore him most of the time, but he's well deserving (not to mention another reason I don't like Beren). Sw n for Finrod Felagund!